Love destinations with lots of color and character? Travel to St. John’s, the capital city of Newfoundland and Labrador, one of the world’s most colorful cities with vibrant attractions and activities thrown into the mix. No trip to St. John’s would be complete without visiting Signal Hill, one of Canada’s most historically significant sites. 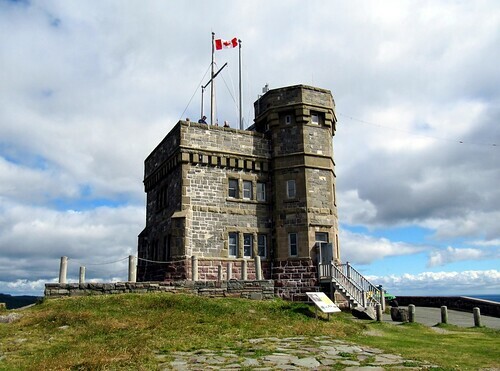 As the highest peak in St. John’s, Signal Hill served as the scene of the final North American battle of the Seven Years War as well as the location of the first transatlantic wireless telegraph. While here, you can tour the Cabot Tower, named for the explorer who discovered Newfoundland, and relish in breathtaking views. If your visit is in summer, you can attend the Signal Hill Tattoo event, which parades the Royal Newfoundland Regiment of Foot adorned in full military regalia, drums and muskets. When you see the vibrant array of multicolored buildings in the downtown district, you will see why St. John’s is often voted as one of the world’s most colorful cities. The downtown area is where you will find an abundance of hotel choices, restaurants, bars, shops and bargain boutiques. A stroll down the city’s famous George Street is a must-do. Playing host to several festivals and celebrations, downtown George Street contains one of the highest concentrations of nightlife venues in North America. If you are going to visit St. John’s, it would be a shame to miss out on a short 20-minute drive outside of the city limits to see Cape Spear, North America’s easternmost point. You can check out the lighthouses here, enjoy walking trails and enjoy awe-inspiring views of the ocean. If your visit is in spring, you may have the opportunity to admire whales and icebergs. For art and culture experiences in St. Johns, The Rooms is your one-stop venue. As a major cultural center, The Rooms is a huge complex housing the Provincial Archives, the Art Gallery of Newfoundland & Labrador and the Newfoundland Museum. With a collection of more than 7,000 objects, you can view a wide range of art works, artifacts and historic items. What’s more, the Resource Center for the Arts and the St. John’s Arts and Culture Center both offer art galleries and live theater productions. If you want to get outside and enjoy the beautiful outdoors surrounding St. John’s, the city offers several public parks with various recreational activities. One of the largest parks in Canada, Pippy Park features more than 3,400 acres of groomed landscapes, woodlands and rivers. Here, you can enjoy hiking, camping and golfing as well as snow skiing, tobogganing and snowshoeing in the winter. Additionally, this vast park is home to the Fluvarium, a facility where you can observe the underwater world of a natural river. Covering 200 acres, the scenic Bowring Park offers an outdoor swimming pool, tennis courts, charming bridges, playground equipment and a sculptured duck pond. Although it experiences chilly winters and frequent fogs, St. John’s features summers with temperatures that are pleasantly comfortable. If you can’t wait to see St. John’s, you can begin a trip today by stealing one of the great hotel deals available online today.